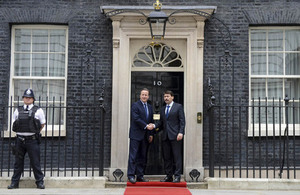 Prime Minister David Cameron met with Hungarian President János Áder and discussed climate change and global water issues. This afternoon the Prime Minister held a short meeting with President János Áder of Hungary. President Áder was in London accompanying a relic of St Thomas á Becket from Hungary to London and the Prime Minister thanked him for bringing the relic to Britain after 800 years. The 2 leaders discussed climate change and agreed that the Paris Climate Change Agreement is an important foundation for progress. They agreed to explore ways in which the international community can work together to build on the agreement, including by investing more in renewable energy and finding ways to store surplus energy. They also spoke about global water issues with both leaders keen to find solutions to international problems of supply and sanitation, with Hungary due to host a World Water Summit in November.